Just because you’re playing a console game doesn’t mean you have to use a console controller. Hori’s Tactical Assault Commander (TAC) Pro brings streamlined PC controls to the PlayStation 4 and 3, just in time for first-person shooter season. It’s first-person-shooter season, a time when the age-old battle between gamepads and the keyboard/mouse combo flares up. A gamepad is quick, simple and portable. The keyboard and mouse combo is a little more complex, but can offer much more precision and customization. With the TAC Pro, Japanese gaming hardware maker Hori seeks to bring that precision and customization to the PlayStation platform, while not completely giving up on portability. Now one can plug nearly any keyboard and mouse into a PlayStation 4 and use them to navigate the console, surf the internet or chat, but not a lot of games natively support keyboard and mouse control. Some companies offer adapter boxes that remap gamepad commands to USB keyboards and mice, but that’s a lot of work. The TAC Pro has all of that covered. Plug in the keypad to the PlayStation USB port, plug the mouse into the keypad, and you’re good to go. 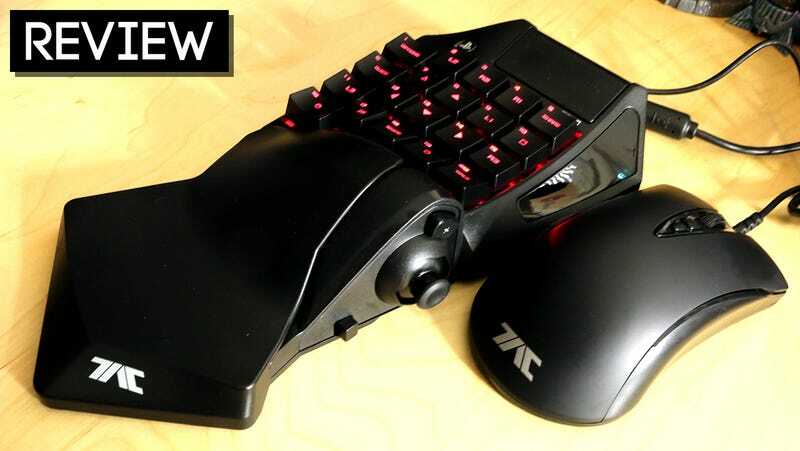 The TAC Pro is basically a mouse and compact keyboard controller, usable with the PlayStation 3, PlayStation 4 and PC. The programmable keypad is mapped to the buttons and sticks of the Dual Shock 4. Movement can be performed via arrow keys or an analog thumbstick on the keypad (there’s a switch on the bottom). The keypad features remappable keys in all the PlayStation flavors, including shoulder buttons, share, options and even a touchpad. There’s a “Quick” button that allows for brief bursts of super-fast mouse movement, and a “Walk” button that automatically slows your movement to a crawl, which is great for impatient people playing stealth games. There’s even a “Snipe” button, which temporarily decreases mouse sensitivity for steady aiming. It’s normal-sized. My hands are giant. The other half of the TAC Pro is a 3200 DPI optical mouse. It’s basically the equivalent of the right analog stick on a game pad, controlling aiming and facing. The left mouse button is fire. The right is zoom and sights. Call of Duty: Infinite Warfare and Titanfall 2 on PlayStation 4, mainly (I play Battlefield on Xbox One for some stupid reason). I was a little hesitant to set up the TAC Pro at first. It seemed quite complex, especially compared to my Dual Shock 4. Once I finally took the plunge, I felt silly for hesitating. Setting the TAC Pro up is mainly a matter of just plugging it in. There’s a little bit of a break in period (during which I kept mixing up my duck and sprint buttons, an easily remappable problem to solve), and I would definitely recommend maxing out the control sensitivity in your games’ options mention for the best results. After an hour or so of play, it’s pretty much second nature. I don’t normally do video for our hardware reviews, which is stupid. Now I do. Check out the Hori TAC Pro in action below. Mind the audio fluctuations, still working on the process. That’s Keyboard and Mouse Control Alright: Initially it is very strange, playing a PlayStation 4 game with a mouse and a keypad. Even though I have my consoles hooked to a PC monitor, there’s still a part of my brain rebelling against the idea. Once I was acclimated, that portion of my brain slowly began to back off. I did notice enhanced precision, especially while sniping. The “Quick” button is not something one should hit accidentally, but once you start hitting it on purpose the lightning-fast turns possible seem almost like cheating. Did I Mention The Keyboard Is Mechanical: The TAC Pro does not feature some cheap membrane nonsense, but rather Hori’s own super-sensitive mechanical switches. They’re the mostly soft, only slightly clicky kind. They’re lovely. Adaptability: While the TAC Pro worked as configured out of the box for both Call of Duty: Infinite Warfare and Titanfall 2, there’s plenty of room for tweaking, reassigning buttons and creating custom profiles. The TAC Pro can store three different profiles onboard, and between the backlit LED display on the unit and simple controls, remapping on the fly is a breeze. A Little Shaky: Though it doesn’t affect play, the base of the TAC Pro’s keyad wobbles a bit on the surface of my desk. This is because the wrist wrest portion of the unit is slightly higher than the main base. Not Quite As Portable: Being that half of the TAC Pro is an actual mouse and not some magical air puck thing, you will need a flat, mouse-y (a real term) surface to use the device properly. If you’ve not got a table or desk, remember that tray tables are your friends. It’s hard to imagine a situation where a fan of PC controls would find themselves with only a game console to play with, but should it happen, the Hori Tactical Action Commander Pro will be there. Or when a dedicated PlayStation gamer wonders how the PC half lives. Maybe they’re curious about how accurate those crosshairs can get. That’s what the TAC Pro is for. It’s not for everyone, especially with its $149.99 price tag, but for the audience it’s aimed at the Hori Tactical Action Pro is quite nice. The Hori Tactical Assault Commander Pro is available from GameStop and Amazon. Get more information at the Hori website.